The display defines the screen resolution on the Mac, measured in pixels, which are the dots that make up an image. The higher the display resolution, the more pixels you have and the sharper the image — but everything on your screen might appear smaller. 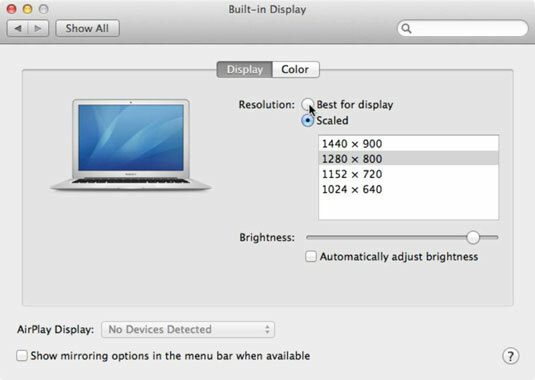 Selecting your Mac display’s highest resolution generally puts your Mac’s best face forward, so to speak, when it comes to making everything look sharp and correct on your screen. Choose Command→System Preferences and click the Displays icon, or click the System Preferences icon on the Dock and choose Displays from the menu that opens. The Display preferences window opens, as shown in the figure. Depending on your Mac model, the image may be different. Best for Display: Sets the resolution to an optimal size. Scaled: Choose a specific resolution to make objects appear larger on screen or to make them smaller so you see more objects on screen. Your Mac immediately changes the resolution so you can see how it looks. If you don’t like the resolution, try again until you find one that’s easy on your eyes. Move the brightness slider to adjust the luminosity of your screen or select the Automatically Adjust Brightness check box to have your Mac adjust the screen brightness based on the ambient light. Click the Color tab, click the Calibrate button, and then follow the steps that appear to tweak the way your Mac displays colors; click the Done button when you reach the final step to return to the Display preferences pane. Click the Close button in the System Preferences window when you’re happy with the screen resolution. The AirPlay Display menu will be active when external monitors or displays are available on the same network. A Detect Displays button appears when you hold down the Option key. Do this and then click the display in the pop-up menu to connect your Mac to it. After you connect another display, hold down the Option key while clicking Scaled to adjust the resolution for that display.